Will Bank of England’s new lending schemes work? 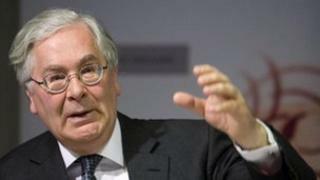 Image caption Sir Mervyn King's scheme is novel, but will it have the desired effect? In case you are interested, this is how the Bank of England's two new novel schemes for lending to banks will work. The Extended Collateral Term Repo (oh yes), whose details are being announced today, will allocate a minimum of £5bn every month to banks in the form of six month loans to them. The point is not so much the duration of the loans: there is another Bank-of-England scheme that already provides six-month money. It is that the credit will be provided to them against the security of pretty much any assets that the banks have, rather than the more narrowly defined and better quality assets that the Bank currently insists they provide. To put it another way, the Bank is saying that in a business-as-usual way, with no stigma attached and at a cheaper interest rate, it will provide the funds that till now it would only provide through its so-called discount window - which is where banks go to borrow in an embarrassing emergency. Why does this matter? Well, it represents the Bank of England saying very publicly that it will provide whatever cash the banks need, whatever the financial weather. So if banks are hoarding cash because they fear that any minute now the eurozone crisis will become so terrible that they won't be able to borrow what they need from normal creditors, they can relax, stop hoarding and start lending again. Funnily enough, earlier this week when I interviewed Hector Sants, the outgoing chief executive of the Financial Services Authority, he said the banks were indeed sitting on more cash than they need to do, rather than lending it, because of their fear of impending crisis. So maybe the Bank's Extended Collateral Term Repo (get used to it) will address that problem. That said, I asked a prominent banker whether he was stocking up on more cash than was strictly necessary. His reply was pretty grumpy, especially when I told him that Mr Sants had said to me that banks like his were holding more cash than the regulator was insisting they had to do. This banker said the FSA was being disingenuous. "The FSA says in public that we're sitting on more cash than they are forcing us to hold," he said. "But in private, the FSA's people make it almost impossible for us to run down our cash." I put this to a Treasury official. He said that the Bank of England's scheme should persuade both banks and FSA to lighten up: the mere existence of the Bank's new guarantee that easy money is available to banks should lead to an opening of the lending valve. All that said, it is the other scheme - with the snappier moniker of "Funding for Lending" - which is far more radical. Because it involves something that the Bank of England and orthodox central banks almost never do - which is to lend money with the express purpose of getting it out into the real economy, rather than just providing the marginal credit that commercial banks need to operate efficiently. 2) The banks will only receive the money from the Bank of England if they cross their hearts and hope to die that they will then pass it on in the form of loans to businesses and households - although it is extremely unclear how the Bank will monitor this is happening. 3) There is no limit on how much the Bank of England would like to lend in this way, but it and the Treasury both talked about how a 5% increase in lending to the real economy, equivalent to £80bn of net new loans, would be useful. One technical thing about the Funding for Lending scheme is that the Bank of England - right now, and this could change - does not think it will provide cash (or so-called high-powered money) to the banks. Instead it will probably provide Treasury bills, or very short term loans, which are a proxy for cash, because otherwise it thinks that the scheme could complicate the way it controls the amount of money in the economy (monetary policy) in some unspecified way. The other question which the Bank of England and Treasury were really touchy about is whether the Treasury - or taxpayers - will indemnify the Bank against the risks it is running with the lending scheme. The Treasury thinks an indemnity is not needed, that there is very little danger of the Bank of England incurring any losses. But the Bank of England seemed pretty uptight about all this - and, I understand, the issue of whether taxpayers will guarantee the scheme is not definitively settled. There are two elements to the risks of the scheme. There is a risk that the Bank of England won't get the loans back from the banks. That risk seems pretty small, because the Bank will impose big discounts, or haircuts, on the assets it will take from banks in return for the credit it provides to them. And then there is the separate risk that the banks themselves are being asked to take when lending to the real economy. Here is where bankers privately express their doubts about how effective the two schemes will be. Bankers give me two reasons for their doubts about how far the schemes will revive our anaemic economy. First, they say creditworthy businesses and households are reluctant to increase their debts in these uncertain times. Second, many of the companies and individuals desperate to borrow are those in some financial difficulties, so the banks don't actually want to lend to them. Here is the nub of the matter: the Treasury and Bank of England want the risks of lending to stay with the banks; but if that remains the case, the new credit almost certainly won't get to those who most need it. The big outstanding question for the Treasury, therefore, is whether it is prepared to expose taxpayers to the probability that some businesses and households, who may deserve to be kept afloat, would not be able to repay all of what they owe.